COVENS -Cartes Des Courones Du Nord Qui Comprend les Royaumes de Danemark, Suede & Nowege, &c.. [together with] Seconde Carte des Courones du Nord..
COVENS, J. 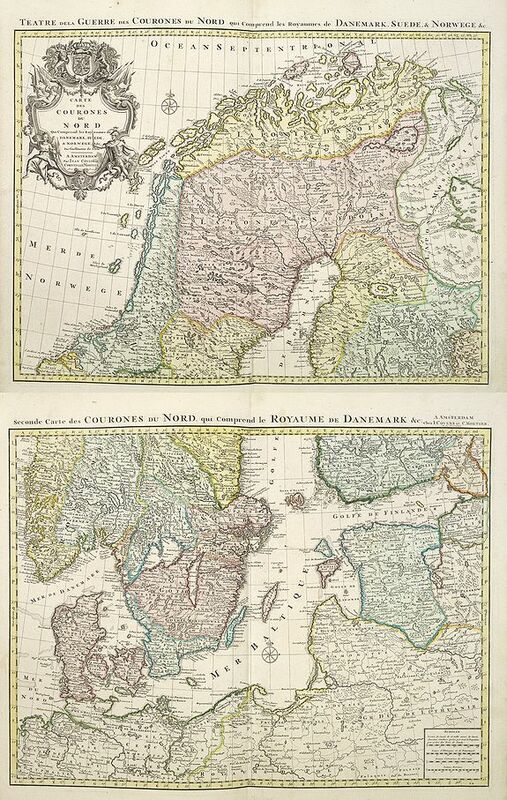 / MORTIER, C. - Cartes Des Courones Du Nord Qui Comprend les Royaumes de Danemark, Suede & Nowege, &c.. [together with] Seconde Carte des Courones du Nord..
Cartes Des Courones Du Nord Qui Comprend les Royaumes de Danemark, Suede & Nowege, &c.. [together with] Seconde Carte des Courones du Nord.. - COVENS, J. / MORTIER, C.
Size : 18.1 x 23.7 inches. / 46.1 x 60.2 cm. Description :Large, highly detailed two sheet map of Scandinavia. Beautifully engraved with a decorative title cartouche and 2 compass roses. Shows illustrated topography with roads, rivers, lakes, mountains, forests, islands, etc. The southern half includes the land surrounding the Baltic with "Petersburg" at the very eastern edge. The war referred to in the title was the Northern War in which Sweden, under the young Charles XII was opposed by Russia, under Peter the Great, Poland and Saxony under Augustus II, and Denmark. The first ten years of the war, 1699-1709, went extremely well for Charles and Sweden, but from then to peace in 1721 quite badly: Charles was killed in the trenches in 1718, and Sweden was notably diminished in power, prestige and territory. This is a two part map from a Dutch edition of De L'Isle's work entitled, Atlas Nouveau, Contenant Toutes Les Parties Du Monde, Ou sont exactement Remarquées les Empires, Monarchies, Royaumes, Etats, Republiques &c. Par Guillaume de l'Isle. Premier Géographe de sa Majesté. It was published by Covens and Mortier, brothers-in-law who continued the firm established by Pierre Mortier. Condition : Two maps together measuring 90x60cm. Printed on heavy paper, slightly age-toned. Very good condition.